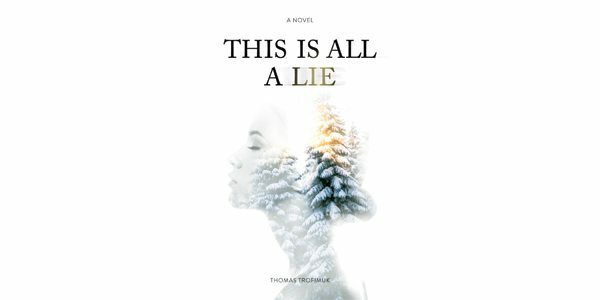 Readers will notice something amiss from the very opening of This Is All a Lie, the new novel from Edmonton writer Thomas Trofimuk. It might be that the first page is numbered 320, with the page numbers descending as the book progresses. It might be that the opening section is titled “1/2,” or that it begins with direct acknowledgement of the reader. It might be that the next chapter is called “A Note on the Font,” followed by one called “Acknowledgements,” then one called “Epilogue.” Do not be alarmed. It’s clear from early on: we’re in the realm of metafiction. Many readers are — perhaps rightly — somewhat gun-shy about such an approach (some might refer to it as gimmickry). In Trofimuk’s hands, the metafictional aspects include direct authorial interruptions, non-linear timeframes and loops, and the incorporation of seemingly unconnected material (let’s just say that the note on the font is crucially important and, though the author may deny it early on, there are in fact Vikings in this book). Trofimuk, however, is never limited or over-awed by these techniques (or his own cleverness). Rather, he uses them fully in support of very traditional narrative values, including clear (and suspenseful) storytelling and character revelation and development. This Is All a Lie is, in fact, a powerful, dazzling novel that comes complete with a rich payoff, both intellectually and emotionally. The novel concerns itself with three focal characters. Ray is breaking things off with his mistress, Nancy. As he leaves her building, Nancy calls his cellphone and threatens to jump from her penthouse apartment. Desperate to save her, Ray tries to keep her talking. The third character, Tulah, is Ray’s wife, with secrets of her own. The lengthy phone call between Ray and Nancy forms the spine of the novel. It’s a conversation about the nature of intimacy and truth, the weight of the past and the delicate lies of the present. It’s utterly harrowing, and fraught with genuine peril, both psychological and physical. Surrounding that central plot device is an exploration of the central trio’s lives, both individually and in collision. Ray, who trained as a lawyer, is now an arborist, with a keen acuity about the trees in his care. Nancy is a Russian immigrant whose father was killed in Afghanistan, and whose brother is a highly protective mobster. Tulah is a science teacher, a bulwark against the rising forces of fundamentalism. Readers will be immediately reminded of Italo Calvino (whom Trofimuk cites in an author’s note on page 2). The invocation of the reader in the novel’s opening seems a direct reference to the opening of the Italian postmodernist’s most famous novel, If on a Winter’s Night a Traveler. The major touchstone here, though, both thematically and in terms of approach, is Milan Kundera. The experience of reading This Is All a Lie – with its intellectual complexity and devastating, bifurcated ending – is akin to Kundera’s investigation of love, intimacy, sexuality, and honesty. This Is All a Lie is a powerful, dazzling accomplishment. I strongly suggest you follow Trofimuk’s advice on page 4 – the last line of the story. “Trust me.” More importantly, trust him. He won’t steer you wrong.